Stud attachments are often too adhesive and too susceptible to damage for use in geriatric patients, especially when implants are angulated. This study aimed to evaluate alternative anchoring systems comprising individual and prefabricated polyvinylsiloxane (PVS) attachments. A total of 182 specimens with individual PVS (IPVS) attachments (Shore hardness [SH] 25, SH50, SH65], prefabricated PVS (PPVS) attachments (SM green, yellow, and red), and Locator attachments (LR blue) were fabricated (n = 7 per group). Retention force was measured using the following parameters: insertion/removal (100, 200, 500, 1000, and 5000 cycles), thermal undulation (10,000 cycles at 5–55 °C; one implant per specimen), implant angulation (0°, 5°, and 10° convergence and divergence; two implants per specimen), and artificial saliva. Insertion/removal and thermal undulation caused no changes in retention force in SM green and IPVS subgroups; conversely, LR blue, SM red, and SM yellow attachments exhibited significant decreases in retention force of up to 66% (all P ≤ 0.001). Implant angulation produced relevant changes in retention force only in LR blue attachments. Artificial saliva caused a general decrease in retention force. Retention force of low-retentive PVS attachments proved to be comparatively immune to dislocation and thermal undulation, as well as to implant angulation up to 10°. Low-retentive PVS attachments could be a treatment option if reduced denture retention is required and/or if angulated implants are in place. Clinical studies are necessary to evaluate the materials’ durability under oral conditions. 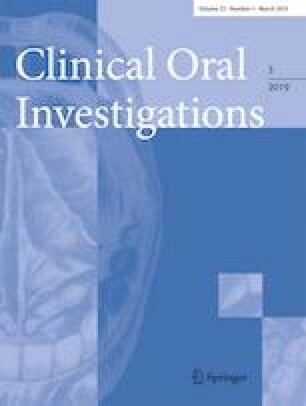 The authors thank Bredent Medical, Senden, Germany, for supporting this study by providing materials.